March 26, 2007 | Comment? Ever since the remote control’s co-inventor Robert Adler passed away a few weeks ago, I’ve wanted to own one of the first remote controls. After trolling through eBay every now and then, I finally have in my hands a piece of the history of the button. But there’s a mystery: which piece? Here’s the Space Commander 300. Just two buttons, one for Channel, one for Volume. Push the Channel button to go lower one channel. Want to go higher? Sorry, you have to go lower until you go all the way round the circle. Similar for Volume, three settings for Low, Medium, High, Off. Here’s the Space Commander 600. Now with four buttons! Two for Channel Lower and Channel Higher, far more civilized. One for Volume. One for Mute. Plus, as the remote says, “adjust hue after pushing mute.” Yes, you have to mute the TV to adjust the color. That’s a classic example of the danger in overloading buttons. The next thing I had to do was open them up to look inside. Just four little screws. What could go wrong? Inside the Space Commander 300. All these early remotes are purely mechanical. No batteries at all. When you push the button, a small hammer strikes an aluminum rod, triggering a sound above our hearing range that’s picked up by the TV. Each rod is a different length, thus a different frequency, thus distinguishable by the TV. Damn clever. Note also the two empty slots in the middle. The case is ready for the next model. They had a product roadmap in mind. Inside the Space Commander 600. 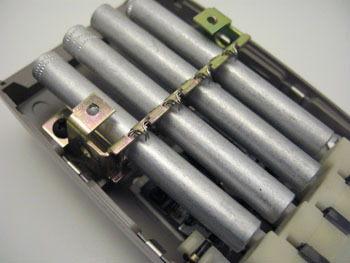 Now with four aluminum rods, one for each button. Notice how all the parts are identical to the 300. 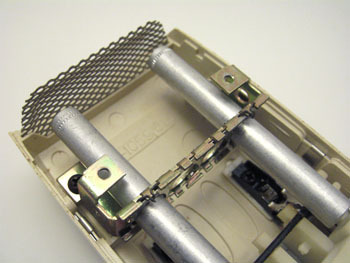 They planned the manufacturing out well in advance so they could simply use the same molds in production. But the mystery is, are these really the first remote controls? 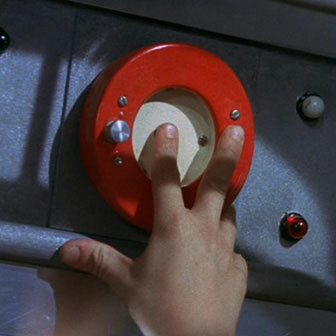 There were two remote control products prior to the Space Command. The Zenith Lazy Bones came out in 1950, but it was wired, a wire running across the living room from couch to TV, tripping Grandma along the way. 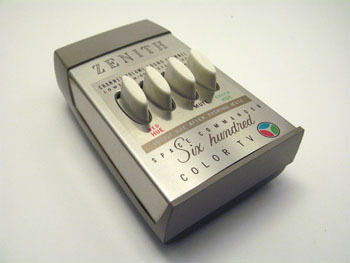 In 1955, Zenith produced the Flash-matic, basically a flashlight at a specific frequency, but ambient sunlight sometimes changed the channel. Then in 1956, the Space Command which used ultrasonics as we saw above. So did I have the first Space Command? I wanted to learn which years the various Space Command models were released, so I tried using this new thing on the World Wide Web called Google. Have you seen it yet? I was assuming that the Space Commander 300 I had was the first. 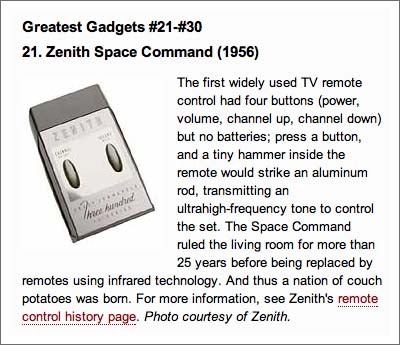 Look at this listing from PC World’s 50 Greatest Gadgets of the Past 50 Years. Yes, that’s pretty clearly the same remote I have, the Three Hundred. But the first clue that something was amiss was the article described four buttons, yet this had two. The mystery deepened. 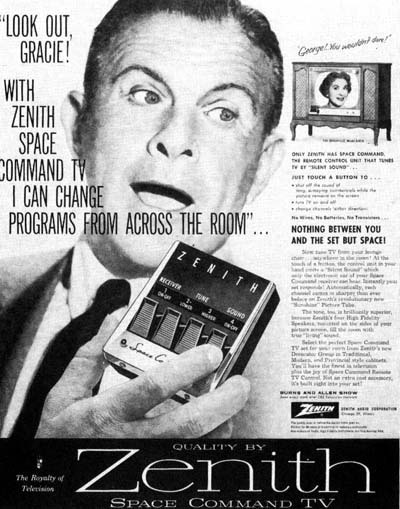 Look at this Zenith ad from 1957 featuring George Burns. And then this image from a great write-up on Adler’s passing at Design News. Uh oh. That is also a Space Commander 400. Yet there is another Space Commander 400 in the same form factor as the 300 and 600 shown above. Zenith used the exact same name for different products, one of the cardinal sins in product marketing. So now what? My inner information architect wants them to have different names, so let’s name them. How do we distinguish them? Button shape will do. The buttons in the top version look like ovals. The buttons in the second version look like gas pedals in a car. Oval. Pedal. Now we can actually have a conversation about them. 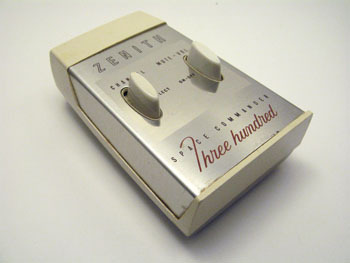 Both Oval and Pedal use the name “Space Commander.” Pedal uses numbers to describe the model (300). Oval uses words (Four Hundred). The Wikipedia page on remote controls shows an image of Oval, but we all know the dangers of trusting Wikipedia as a solid source of knowledge. I have a feeling I was duped, but I wasn’t the only one. The Oval model is almost always used in articles that discuss the Space Commander as the first wireless remote control. But it seems that the Pedal model may really have been the first. My hunch is that Pedal was used from around 1956 to 1958 and then Oval was used from 1958 to 1965ish. After that, other models of Space Commander showed up. Zenith just kept using the same name over and over. Very confusing. 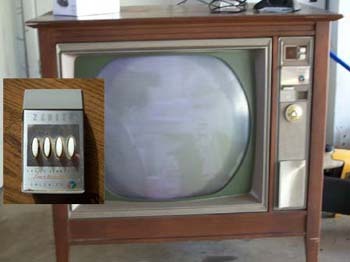 I’m hunting for good forums of early TV collectors to ask them. They’re the experts. I’ll let you know what I find out. I know you won’t be able to sleep until then. 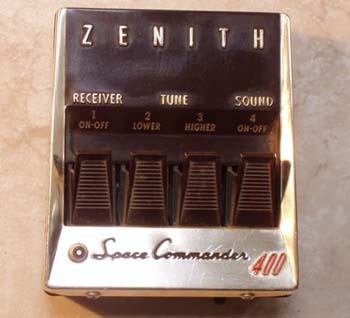 Zenith Space Command, the first 20 years.